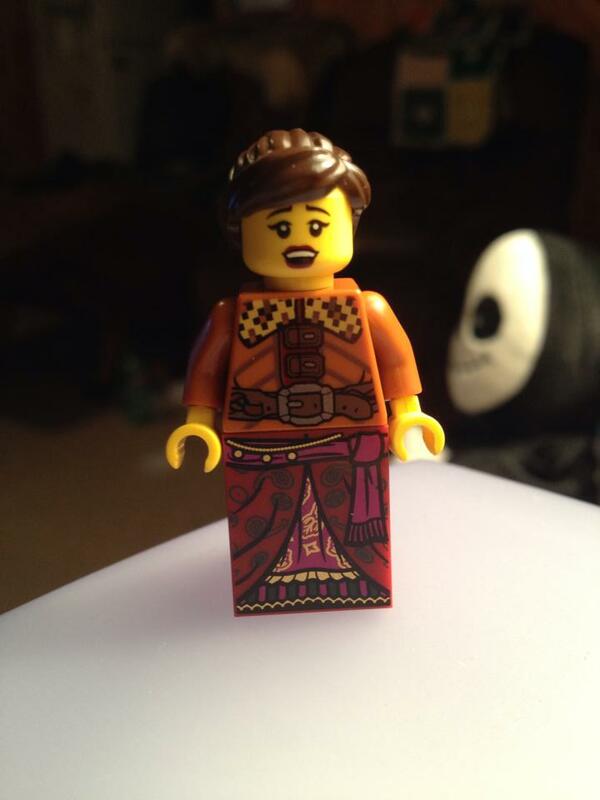 One of my role play buddies, a fellow northwoods Longfang (and player of Reyna’s cousin), has little Lego Minifigures for each of the characters. Based on my descriptions of Reyna and my personal tendencies he designed a figure to be Reyna, before I’d even completed any Garb. Pretty cool, isn’t it? It gave me a pretty good starting point, and I decided that I would based my initial garb (loosely) on it. It’ll have a little bit less of the extreme color variations shown here, but I like what’s there to start with. So, this means that I’ve got yards of rusty orange colored linen waiting to become a dress, a bit of brown flannel waiting to become a waist cinch (I’m riffing the lego figure, not copying it, after all), and I’ve already got a few odds and ends done! Specifically, I finished a belt (which I’ll talk about it another post, since the head covering that matches it isn’t completed, and the part that’s not done of that will match the cinch, so I’ll show those items off all at once instead of piecemeal.) and a shawl already. The shawl is what I’m going to talk about from here on out. It was made from a knitting pattern designed by Lima Bean Lover that I made a few executive decisions concerning. The first decision I made was that I wanted it to be more openly knitted, so I went with size 13 (9mm) needles. Then we get into the wooly look of the shawl on the minifig, so I used Lion Brand Homespun in Pearls (#412). Then, instead of 16 stitches wide, I went with… 40, I believe. I finished this last week, actually, I didn’t take notes at all. Just knitted like a mad-woman. The Shawl pin is also something I made. It was cut from a section of poplar doweling. I whittled the point by hand with a freshly sharpened army surplus knife (supposedly of french origin…) and then sanded it down with one of those sanding sponges. Following that I wood burned the lines into it and oiled it about a half-dozen times with butcher block oil and then polished it (twice) with Howard Brand feed-n-wax polish. I know the picture could be nicer, and show more of the shawl. I decided to only show it folded up on my desk at this time because once the new dress, cinch and suchlike are done I’m going to take a full-on photo of the assembled garb. The only thing that will be missing would be the feral-green eyes (Pinky Paradise is closed for 2 weeks and I couldn’t sneak in before the cutoff and get things shipped).